New items on our menu! Those of you who are frequent guests know that we have many classic items on our menu. Our Breakfast Smiles, Nantucket Cod, and of course, the Superburger are perennial favorites among guests. However, we try to add fresh, new selections to our menu at least a few times a year. So, allow me to introduce you to a few items that we’ve just added. 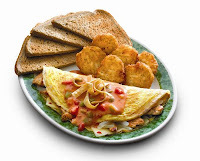 First, our Chicken Fiesta Omelette. We’ve stuffed this 3-egg omelette with grilled fajita-seasoned chicken, Pepper Jack cheese and onions, and we’ve topped it with spicy queso sauce and tortilla strips. You might ask, “Who eats chicken for breakfast - and how did you come up with this one?” Well, just last year, John Frick and I took a trip to San Diego where we tasted a similar item. We returned home, shared it with our menu development committee, and after a few tweaks to make it our own, the Chicken Fiesta Omelette was born. The next two additions are guest favorites from our fall specials menu. You ordered, we listened! The Mile-High Meatloaf and the Gourmet Grilled Cheese are two comfort foods that are now here to stay. The meatloaf is stacked with mashed potatoes, gravy, and onion rings – all atop grilled Italian bread. Ever wondered how meatloaf came to be? Check out my earlier post on this American institution. The Gourmet Grilled Cheese is a fresh take on a classic sandwich, with melted American, Swiss, and Pepper Jack cheeses and bacon on grilled six-grain bread. It makes my mouth water just writing about it. Keep an eye out for new specials and menu items throughout the year. And, when we have a special that you really like, let us know by posting your comments here. We may just decide to put it on the regular menu! Thanks for returning the Grilled Cheese Sandwich - Now, where's the Tomato Soup? We love eat n park. Eat there every sunday and sometimes during the week. The waitress's all know us, and know our usual orders. I'd like to see more Vegetarian options --- such as Vegetarian Soup (like Panera makes) or vegetarian Calazone, or a Vegetarian Hoagie. My two sisters and I are Vegetarians and would appreciate something else besides the salad bar or eggs. Try this...grilled cheese with tomato and bacon...yummy sandwich! Miss the shredded pork with horseradish sauce sandwich. Hope you bring it back. The gourmet grilled cheese is not the same without the tomato soup! Please bring the soup back!! I am very happy to see the gourmet grilled cheese sandwich back. But I agree with the other posters-it needs to be paired with the tomato soup. I can only eat grilled cheese sandwiches when they are dunked in tomato soup! Please bring back the baked ziti -- we loved it!! Pittsburgh’s goin’ to the Super Bowl! To our loyal guests….Thank You!